Blast those pimples away with Spots Got Shot! As an intensive acne treatment serum, it dries out zits, soaks up excessive oil, prevents acne from reappearing and speeds up the normal cell healing process. Its anti-acne and helps scars to fade out, leaving you looking vibrant and healthyl! spots got shot was added to your shopping cart. Best for acne-prone skin, teenagers and adults. 1. Use Spots Got Shot daily, morning and night, after cleanser. 2. Tip on the affected area. 3. The content of the product can be used for 12 months after opening. 4. The product lasts up to 3 months until completely used. Purified Water (Aqua), Cetyl Alcohol, Butylene Glycol, Disodium Lauriminodipropionate,Vitamin E (Tocopheryl Phosphates), Trimethylpentanediol/Adipic Acid Copolymer, Cyclohexasiloxane, Cyclopentasiloxane, Glyceryl Stearate, Lactic Acid, PEG-40 Stearate, Dimethicone, Glycerin, Glyceryl Stearate SE, Zinc PCA, PEG-10 Stearate, BHA(Salicylic Acid), Polysorbate 80, Sulfur, Propylene Glycol, Diazolidinyl Urea, Disodium EDTA, Methylparaben, Propylparaben. It really helps to fade away the acne scar. This cream is really useful. I bought it as i had a really big acne and tried a diff pimple cream product which ended up being worst and getting bigger. Luckily i got this quick enough and delivery was fast! Use it and in 2 days it recovers alot. Really thankful for it! The best product and it really helps when having menstrual period, my face will growth 2-3 ance. I love this product. My face has many red spot and as i used this product. I can see changes on my face. This product highly recommended. Works great on acne. It is a small bottle, but only use a very little amount on acne. One bottle last for pretty long time. Will repurchase again! This spot treatment is working on my acnes. I sometimes have acnes on my forehead. I apply it after the toner, twice a day. For 2 or three days, the acnes are becoming dry and smaller. And it is absolutely OK for sensitive skins if applied to some area. Highly recommended. Не совсем поняла это средство (покупала по акции вместе с blackheads sebum gel). Но с покраснениями вроде справляется нормально плюс очень экономный расход. + 15ml seems very little, but turns out you don't need a lot for a single use even if you're applying it to a moderately large area. Of course though, I'd still prefer it if it came as a higher quantity for the same price. - Results are VERY gradual or almost none, depending on how you see it. I've been using it for a little over a month and there is improvement but very little. I'm not sure whether that little change was just because of time or the product. + The texture is nice, white-ish, non-sticky. - The smell is a bit (unpleasant) weird, but only a little, not sure how to describe it, it doesn't last long anyway. + The serum never caused irritation, I don't feel anything after applying it. So no stinging feeling either. Spots got shot is amazing. It is unlike any pimple cream I have used before. There is no redness or dryness. I haven't had any terrible spots since I started using this serum. It smells a little funny but I don't care as it works like a dream. I've been using this for about 2 months and I'm enjoying it so far. My acne on my face suddenly flared up so I used this hoping it'll reduce them after nothing else worked. And it worked well! My acne has gone away, although it's still around, but it's gone down a lot since I've started using it. My skin did get a little dry, but that's expected with all acne products. Will be buying again! I never had spots even as a teenager. But when I had a batch of zits bursting out of nowhere around my chin area, I was completely clueless. I had never had experience with pimple creams and didn't know what was good in the market. 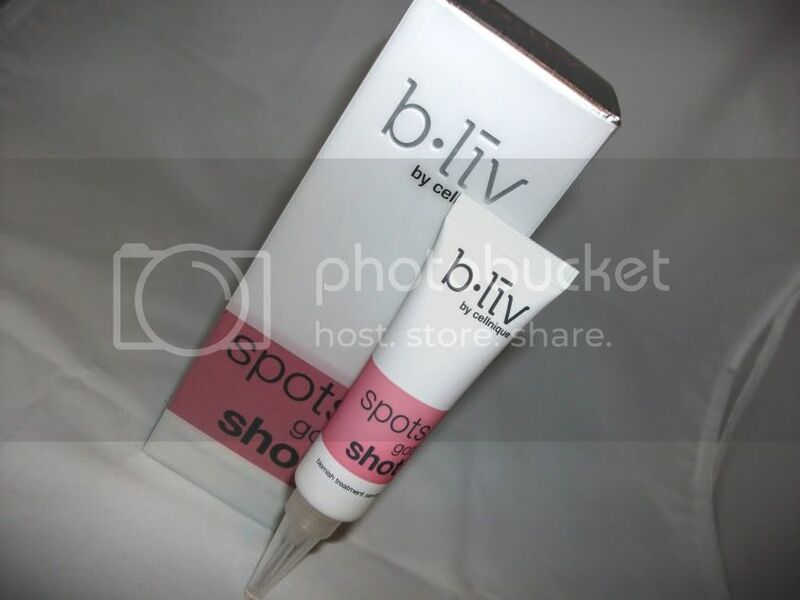 Since I've had a very good experience with b.liv I decided to check out their acne products. I ordered this online and received it in less than a week in Dubai. Along with a free sample. Nice. The product itself was easy to use and handy. I put on a huge blob on each zit (enough to cover the pimple) everyday after cleansing my face. The effect was quite rapid. The next day the original swelling subsided and it was not painful anymore. There was no scarring and the subsequent redness took a few weeks to heal but after a month there was no need for concealer anymore. Pretty good. Overall quite effective (almost overnight relief of pain and swelling) and no scarring. The redness do take a while to disappear though, depending on the nature of your skin. I wouldn't be looking around for a better blemish cream after this. This seems to be good for me. I've heard of some creams that can be very drying and there was no such effect on me.